Back in 2009 and 2010, Lucasfilm put together a Concert tour featuring the legendary music of John Williams performed live by an orchestra with clips from the films playing on a massive screen behind them in arenas around the world. The concert was hosted by C3PO actor Anthony Daniels who would also tell the story of Star Wars between music pieces. Take part in an unforgettable concert experience with cutting-edge visual technology and sound design. The iconic music of John Williams will guide you through the legendary battle of light and dark and immerse you into the worlds, characters and story of Star Wars. 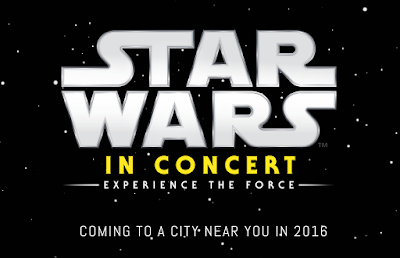 Be one of the first to get concert information and offers for STAR WARS: IN CONCERT by subscribing now! You'll be able to secure your tickets before the general public and take advantage of exclusive special offers. Subscribing gives you "members-only" benefits that people in the crowd would dream about having. I'm very excited by this announcement. I saw Star Wars: In Concert back in 2009 and it helped reinvigorate my fandom. I was also lucky enough to go to the Comic Con concert that JJ Abrams and Kathleen Kennedy put together at San Diego Comic Con which was very similar to Star Wars: In Concert in many regards. Having been to both I can tell you that this will be a can't miss experience and I highly recommend checking it out. I know I'll be buying my tickets as soon as they go on sale! Seen this in Dublin in 2010. It was spectacular. I remember thinking Anthony Daniels looked drunk, his eyes were totally bloodshot, but he was most likely tired from touring. An epic show nevertheless. I highly recommend it! saw it when I was 10 years old, I loved it, it was spectacular, I wanted to see it again, so there is my chance. No like Episode 7 music.no new maine theme ,no memoral music moment.what happen!! BRING THE SHOW TO ATHENS GREECE PLEASE.. I took my whole family in 2009! My kids( now 12 & 16), can't wait to go again! It was a magical time. What is the date of the concert. I need to know. if you need me email me. Here are my emails - pnkfangirl@aol.com , katyperry798@aol.com , and I'll tell you the new one when I make one. But that might never happen until INFINITY Years, Days, and so on. ......... . Here it is. It is thenewdarkandlightside@gmail.com. I don't know if this is a good sign or not. Any news/updates on this? I'm guessing it's not happening this year unless it's a very limited release. I went to the one in Anaheim, Calif at the Honda Center. I think around 2008/09. It was awesome! Can't wait to do it again! Star Wars music, which is executed by alive orchestra! What can be better! I hope, this event will in my homecountry too and I buy a ticket here https://ticketselect.co.uk/newmarket/mark-ronson! 2016 year is brings a lot for music-lovers: Van Morrison, Bryan Adams, Lisa Stansfield, Mark Ronson and others give their concerts. I like Star Wars orchestra from every film I've watched. So I ordered tickets on https://ticketcrab.com/concert-tickets and had a great time! I recommend this concert for all!